Dr. Angie Finkes is from Springfield, Ohio. She attended Kansas State University where she had a full scholarship to play basketball and graduated with a BS in Animal Science. 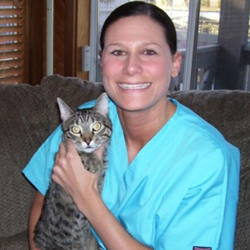 She then continued on at Kansas State and graduated in May 2006 with her Degree of Veterinary Medicine. Dr. Finkes moved to Mooresville in August of 2007 and along with Dr. Shivers became the new owner of Brawley Animal Hospital in February of 2010. Dr. Finkes enjoys all aspects of veterinary medicine but especially surgery and internal medicine. In her free time, Dr. Finkes enjoys being out on the lake and spending time with her friends, family, and furkids.